Experiencing annoying aircon breakdowns? This might be the case when your air conditioner does not undergo regular aircon servicing. 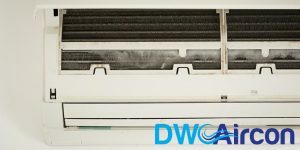 There are a variety of reasons why your aircon unit is experiencing problems – while some may just need a gas top-up, other units may require an aircon chemical overhaul. There can be two parts to this problem. 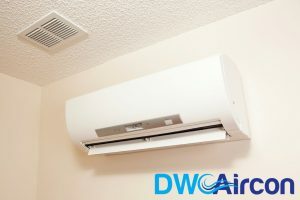 Firstly, your aircon unit can be experiencing a weak air flow, which leads to it not generating enough cool air for your room. Secondly, your air conditioner might be blowing out hot air. Both of these signs can stem from several reasons. Oftentimes, symptoms like these indicate a faulty system compressor and capacitor, or even a blown fuse. Whatever it is, get it repaired as soon as possible to prevent worse aircon problems like a refrigerant leak. Most aircon gas pipe leaks are not as easy to detect compared to a water leakage. But there are still troubleshooting measures that you can carry out on your own. In some cases, the unpleasant odour of poisonous freon gas is quickly noticeable when the aircon leak is happening from your indoor unit. However, you might have to check your outdoor compressor unit for such smells. Remember to also inspect the pipes and look out for some stains as this can also be a sign of an aircon gas pipe leak. Lastly, you can also check for whistling sounds coming from your thermostatic expansion valve, which suggests low refrigerant levels. 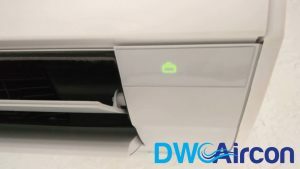 Just like gas pipe leaks, an aircon water leakage can also display itself on either the indoor aircon unit or the outdoor compressor. But unlike a gas pipe leakage, water leaks are less harmful as it does not contain poisonous gas. You may be noticing water dripping from your fan coils or ice building up on your copper refrigerant lines. If you’re unsure about the type of aircon leak you’re experiencing, don’t hesitate to call in a professional technician to conduct an air conditioning repair troubleshooting. 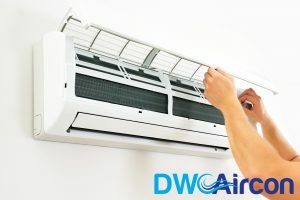 An aircon that switches off by itself can be caused by various problems stemming from not carrying out regular air conditioner servicing or cleaning. A dirty aircon compressor or condenser can lead to overheating, which then prompts the system to shut itself down. Make sure to get your aircon units cleaned properly as an aircon compressor or condenser that’s blocked with accumulated dirt will cost you more in the long run. Still experiencing this problem despite getting your aircon regularly cleaned? Well, the issue might be from your thermostat. A broken thermostat will not be able to correctly gauge the temperature of your aircon, which can cause it to shut down automatically. Don’t delay your AC repair the moment you notice such a problem. Is your aircon compressor refusing to switch on? There are several possibilities causing this problem. Check that the start relay, the capacitor, valves, and terminal connections are functioning per normal. Otherwise, you will need to engage in the services of an air conditioner repair company to solve the issue. One can only stand scraping, whistling, and squealing noises for so long. If you’re hearing noise coming out from your aircon unit, this could very well be a result of a belt slipping out of place or other aircon parts that needs to be lubricated. Get an experienced aircon technician to look into the issue and carry out air conditioning repair troubleshooting. If you’re noticing a pungent smell from your aircon and think that it’s nothing to worry about, remember that air conditioners aren’t supposed to release a foul odour. Sure, you might rationalise and assume that it’s normal for aircon units to do so, but that’s not exactly the case. The odour can either come from a burnt wiring that should be replaced immediately or moldy ductwork. Experiencing any of this aircon repair symptoms? We’re here to help! 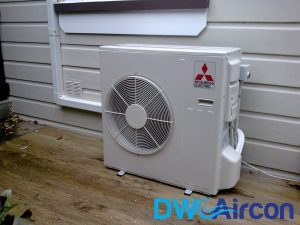 At DW Aircon Servicing Singapore, we offer premium-quality aircon repair Singapore services at affordable pricing. With more than 10 years of experience, our team of aircon technicians is well-equipped with the necessary skills and knowledge to solve any of your aircon problems using the most suitable aircon repair type. We also provide commercial aircon repairs for offices and other commercial spaces. Browse our wide range of aircon projects and positive reviews to see it for yourself!